I bought this for a specific purpose. We were going to Hawaii, and I for once in my life didn't have access to a laptop computer that I could use. My wife forced me to agree to not take a laptop so I couldn't do work when I was on vacation. But, I take a lot of pictures, and needed a storage solution. The Epson P3000 solved the problem. I also carried a USB2 160 GB 2.5 inch hard drive, and was able to make a second backup copy of all images on that, so I was never without 2 copies of every image. I take D200/D300 RAW images, so they are large. And on longer trips (such as that trip to Kauai), I will take 5000 or 10000 images. In reality, the P3000 is too small for me, and on that first trip I took 48 GB of images, and the device could only hold 40GB of them. I had 4 8GB CF cards, so I was not at risk at that point, but for me, larger would have been better. But this was much cheaper than the P5000 available at the time, and I decided to save the bucks. That's really the only limitation that I wish could be changed, that you can't change out the hard drive. But Epson, like Apple, makes drive size part of their business model and marketing, and that's not going to change. The screen is small (if you're used to a notebook screen), but larger than most portable viewers. And the quality of the rendered images is very good. Color rendition is accurate, vibrant, and the images are contrasty and plenty bright. It's much better to view images on the P3000 than on the D200 LCD. But the D300 3" LCD gives the P3000 a run for it's money (D300 is not better, but it's very close). For RAW files, it will render the embedded JPEG, which is fine as long as you understand what this implies. The human interface to the device is easy to navigate and use, and in the end has all of the functions I needed it to have. The User's Guide isn't always clear about how to use it, or about what it can do. For instance it was not clear from Epson's description whether I could actually backup to an external USB2 hard drive. In the end, lots of forum posts confirmed that I could. However, it would not drive the external device power, and so I needed a drive that would support a separate power source. So, for instance, you cannot use it with a WD Passport drive unless you get a USB split cable to supply power from another source. Speed is reasonable, remembering that I'm dealing with large images. Copying a full 8GB CF card didn't take much longer than with most USB CF readers on a notebook computer. Making the backups to the USB drive were not fast, but it was start it and let it run, so I didn't care. You can browse the external USB drive to verify the copy of the images there is good, although doing that is really slow so you would only do it to spot check some images, not to browse a different set of images. I didn't use any of the media features (like music or video) of the device, so can't comment there. But I know the features are there. I have had two other similar storage solutions in the past, neither of which had a display. And that makes them useless. You never know if you have saved your images or not if you can't actually see them. With the P3000, you can see them, and even zoom in on them, and do a great slideshow of them, and even do some culling if you are into that because the display quality is very good given the size. I've tried to go the cheap route when it comes to backing up my digital photos in the field, such as combining the (awful) Aleratec Copy Cruiser Plus with a large-capacity (16G) USB pen drive, and using an adapter and my iPod to offload the data from my CF cards. The latter solution works OK in a pinch, but has several limitations, including the iPod's small screen, the slowness of the process, and the very narrow functionality of the interface (great for music, not quite adequate for viewing, judging, and copying photos). 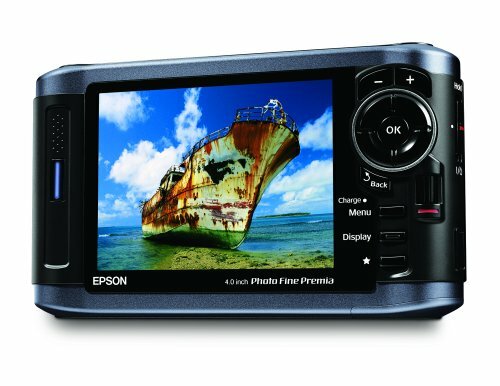 The Epson was designed from the ground up for duplicating digital photos (JPEG and RAW formats) on the road, a necessary task for photographers who prize their images as well as their sanity. It should fit nicely into any photo professional's 'out-of-doors' workflow. The device works very well (and pretty fast: for instance, I just copied 322 Mb worth of data -- that's 100 JPEG photos taken with a 10-megapixel camera at the highest-quality settings -- in just over 60 seconds). The 4-inch screen is bright and draws beautifully detailed images. The controls, while not the latest in ergonomic excellence (the 'back' button in particular could have been better placed), are easy to press and a cinch to figure out (I never even had to crack the manual). Like my Apple computers, the Epson multimedia viewers stand out for their plug-and-play elegance and simplicity. Push a CF card into the slot, or an SD card in a different slot next to it, and the viewer offers to let you browse the files on the card or copy the data to the P-3000's hard drive. You can also copy data to or from a USB device such as an external hard disk or a thumb drive. Want more? You can hide and password-protect folders; play slideshows with or without visual effects and with or without built-in music files playing as a soundtrack; give your photos a one-to-five-star rating to quickly separate the wheat from the chaff; look at EXIF data, blown highlights, and a histogram for each image; use an AV-out cable to show your images on a TV screen, and on and on. Later on, when you're ready to copy your images to your computer, just run the supplied USB cable from the Epson to your Mac or PC and the viewer shows up on your virtual desktop as a standard USB 2.0 drive. After a big job such as a wedding, this obviates the need to copy three or four or more memory cards to your computer via an external card reader. With the Epson viewer, all the backed-up data are already in one easily 'copyable' location. The Epson also lets you copy and play back video footage and MP3s. I have little use for the latter (that's what my iPod is for), but the video-player capability, though hardly crucial for my purposes, makes the P-3000 a pretty sweet and versatile road tool. I can't think of an actual feature that I'm missing -- OK, maybe wireless capability -- though that's not to say that this is a perfect product. The viewer is slightly unwieldy (about the size of the average automotive GPS unit); I have to think that top-notch engineering could reduce the dimensions a bit. I would have liked some kind of built-in protector that you can fold or draw shut over the fairly vulnerable screen. Speaking of missing hardware, the Epsons really should come with a stand that lets you angle the unit for optimal viewing. Also, it's a bit annoying that the device won't copy data to your computer's hard drive unless the unit's power adapter is attached, even if you have a full battery. I'm an underwater photographer and was looking for something that would store my photos as well as let me view them which would allow me to lighten up my packing. This little jewel is going to do that for me! With it I no longer have to carry a laptop just to view my photos. Plus I can carry it to show photos to my friends instead of bulky photo albums. The 4" screen is bright, sharp and big enough to see the detail in your photos. Videos look very nice on it, too. Zooming in is fast and easy. It's a nice size, it's big enough that my husband is comfortable with it in his large hands yet even with the 4" screen it's small enough to keep in a small purse or pocket. It is very user friendly, which is a good thing because the manual doesn't go into a lot of detail but with a little trial and error I had photos loaded, seperated into folders and graded. The only two things I was disappointed in is it does not show Olympus ORF RAW format. I had read that it would but apparently it will read only RAW files from a very select few DSLR's. However, it will show the ORF RAW thumbnails, just not the full photo. So at least I can cull totaly bad shots. The other disappointment is it will not accept XD cards, only SD and CF. I bought an XD to CF adapter thinking that would fix that but it will not work. There are reports of others having this same problem with several brands of adapters but that the Epson adapter is the only one that works. It really isn't that big a deal to me, I just download from the camera to the viewer via the USB cord. It's just as easy to carry the cord as the adapter. With the exception of those 2 points, it fits my needs perfectly. I'm very glad to have it. I used to use my video ipod as a place to offload my CF cards, but being I shoot in raw I couldn't see them on screen. Although, I have not yet used this in the field, I have downloaded Nikon raw files and viewed w/o a problem being able to zoom in, check histogram, etc. and have a display that is large enough to really 'see' the pix is super! You can tell immediately in great color how your shot is. It is easy to use with the menu system to go between music, video and photos and to select what you want to see. I have converted and downloaded dvd's to the player but had some problems with the fps. According to EPSON (who provided a response with 24) the fps must be no more than 24 although the documentation states that 29 will work. The volume on the device thru headphones does not go extremely loud. You may need to increase the sound level on any video conversions you do. It is difficult to hear when using the speaker but since this is primarily for photo viewing, or watching videos while traveling thru headphones, it is not that much of a con. On another review I read that you could not FF or Rewind but the controls do allow for this. It also keeps track of where you left off so you can continue watching from where you stopped. I have tried to play videos on several TVs without any luck. According to the documentation it is pretty straight forward, but so far I have not been successful. Music-wise I have not had any problems. The only odd thing here is that I generally connect the P3000 as another drive and use Explorer to move videos and pictures to and from the device. It seems, however, that to download music you need use the EPSON link software that comes with the unit. I have not run the battery down yet, but haven't played a full video. So far this device has met my expectations and I will probably leave my ipod at home this next trip. The screen is large and bright with no off-axis viewing issues. I bought it to have on location instead of using a laptop to view my images. The Art Director loved seeing the images clearly and easily; she wished all the photogs she hires had one of these. Nice to know the CF cards are backed up to at least one other place for ease of mind. 40 GB is more than enough for a day of shooting for me. The folder interface is a little tricky but once you get used to it, it makes sense. I've also used this recently to store Tivo'ed shows for when I'm not needing the 40 GB. The video play works very well and you can easily plug it into a TV to check out video or still images. The Epson P3000 is a great storage device. The instruction booklet is very bare bones and basic and at time is so cryptic as to be of little use. When putting a slide show together the unit will not allow picture taken vertically to be shown that way. They are show horizontal. I have been unable to rotate them in the unit. I have also been unable to get the unit to accept the rotation when I use either of two editing programs I have. The unit just will not show them in their correct perspective. Getting music into the is also difficult. Over all it is a great unit to move pictures from place to place and store them. I would purchase the unit again and do recommend it. On the plus side, the screen is beautiful and the best I've seen compared to say a SmartDisk (but the SmartDisk is less than half the price of the Epson, even after rebate). On a recent trip to Katmai, an acquaintance showed me a SmartDisk's view and the image was quite pixelated; he was quite impressed with the Epson's display. Four inch is quite big and usable for decision making such as delete. The transfer rate from card to the P-3000 is acceptable, though I didn't time the rate. The P-3000 acts as an external harddrive and the saved files can be easily read by Windows Explorer; that means no additional software is needed, which none was included. On the bad side, this device at $500 for the 40GB is very, very expensive; Dell has a cheap laptop for only $450! I wonder if Epson realized the high price and played with rebates. If going out to the wilderness is not your idea, then it would make much more sense to get a small form factor laptop instead. At $500, the quality should be much better. I checked for bad pixels against a black image and found too many that are always on. Some on pixels can clearly be seen when viewing a typical image. Usage is not intuitive, especially when deleting an image. To delete an image, you have to dig into the menu and go into delete mode as oppose to simply deleting it. So there are a normal view mode and a delete mode and you'd have to navigate between the two. The worst part is that zooming works fine in normal view mode but is disabled in delete mode. It makes sense that when you delete something, you'd want to zoom in, at least for sanity check. I save my files both RAW and jpeg. In the view mode, there's no option to view only RAW or jpeg so you'd have to view both. Obviously, viewing both can be annoying and wastes battery juice. The device can play mp3 and video. If you're going out in the wilderness, it doesn't make sense to waste your battery juice with these options. Since the device is (I think) designed for the wilderness, these two extras are useless unless you have access to an outlet. The screen, though pretty, only has a soft pouch to protect it. The device at 1.3" thick, it's quite bulky. It's not designed for your pocket because of the thickness and bulkiness. I would have liked to be able to return it for a refund but the place that I bought it from only gave me 7 days, which doesn't work when you're on a two week wilderness trip. I am at least can exchange it so I will do that, mainly because of the pixel defects. This device serves its main purpose well and the display is beautiful. If you can spare some battery juice, it's nice for viewing your photos in your tent while waiting for the rain to stop. I would recommend it if you'll travel to where an outlet is not available for at least a few days and a laptop is too bulky and heavy for you; if you don't care about the display, then the P-3000 is too expensive. However, I would not recommend it to anyone who at least have access to AC outlets at your destinations. It's hard to justify spending that much money so you can show your friends your photos. At $500, a laptop option is much better and you can do much more with a laptop, even use the internet at my friends' places. This product is invaluable for anyone who is serious about the security of their digital photos. The bonus is that the Epson 3000 does so much more! What a great surprise to find out I can download my music onto it. I guess I am one of the few that hasn't bought an ipod yet... the other incredible bonus is that it will show your photos as a slideshow & you can use your own songs as a background! WOW!!! I created a file of an unbelievable sunset I shot on my Canon 5D from beginning to end. I shot for about 45 minutes & took about 40 shots. The slideshow was about 20 minutes & is great on the viewer. I found out I could buy a camcorder AV plug & plug it into my television. OMG!!! I stood in my living room & cried. I could not believe how awesome it was to see my photos with my music on my TV!!! My camera is still blowing my mind & now I have a great way to share the photos without having to learn new software on the computer. The Epson P-3000 isn't as complicated as I thought it would be. The viewer is a good size & is hard to see outside in sunlight, but that hasn't been a problem. It's also a great little viewer to show people your pics. I'm happy!! Just have to figure out how to get the slideshows on a cd or dvd. I took the advice of Scott Kelby The Digital Photography Book on some of his recommended items. I bought the P-3000 right before going on vacation as a means to backup my photos while away from computers. I never had to worry about filling up my card. I occasionally shoot weddings & this is a great way to ensure that you don't lose any shots because your card went bad. I've had the P-3000 viewer for a couple of months, long enough to have used it under a lot of environments and situations. The unit has performed flawlessly. It does everything as advertised. Downloads are quick.....quicker than with my Mac notebook, which is particularly useful when previewing photos with clients. The screen is bright and contrasty, with good resolution. I really like the dual card slots, which allow me to download directly to the unit without having to go through a CPU. I can be on location doing a shoot, pop out my CF card from my camera and insert it into the P-3000, and wait a few seconds for the images to come up. With other devices I've owned, I haven't had the confidence to delete the photos from my cards after downloading. I have that confidence with this unit. It's proven itself. The reason I gave the P-3000 four stars is because of the screen resolution. I wish the resolution was higher, since my camera is 12.8 megapixels and I'm not seeing all the detail in the images. However, I knew when I bought the 3000 that its resolution is not as high as the P-5000.